WS-Policy provides flexible mechanism to activate desired functionality on the client or service sides. Article describes how to define policies in custom CXF projects, implement policy-aware interceptors and explains some aspects of internal CXF design regarding WS-Policy. Let look into them in details. Get policy from external location and build it for current message. Parse WS-Policy XML using Neethi library. Store result Policy object into PolicyConstants.POLICY_OVERRIDE message content property. 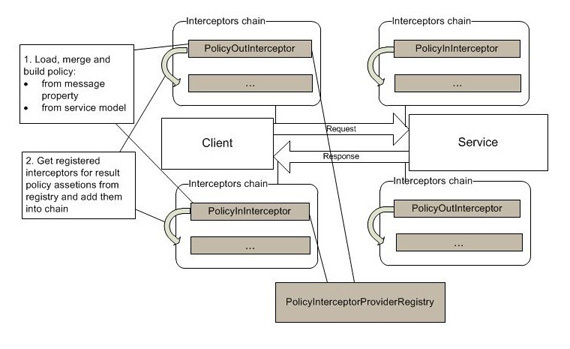 Important is that this custom policy interceptor is called before CXF PolicyInInterceptor or PolicyOutInterceptor. Than CXF will automatically recognize Policy stored into this property and use it with highest priority. I have published a small sample illustrating how to apply policy dynamically. Provide Assertion Builder class for custom assertion implementing AssertionBuilder<T> interface. Interface type can be Element, XMLStreamReader or OMElement. Interface contains two methods: build() and getKnownElements(). Implementation of build() method should construct Assertion from the incoming type. It can be PrimitiveAssertion (without attributes or child elements), NestedPrimitiveAssertion (without attributes but with nested policy element) and JaxbAssertion (assertion described by any XML schema). getKnownElements() method must return QNames of assertion elements from which assertion can be built. Boolean value at the end specifies lazy loading strategy. CXF automatically recognizes the assertion builder and policy interceptor provider and store them into registries: AssertionBuilderRegistry and PolicyInterceptorProviderRegistry. Since CXF 2.6.0 it is possible to register multiple interceptor providers for single assertion. If PolicyConstants.POLICY_OVERRIDE contains policy, it will be taken for further processing. If property is empty, policy will be asked from ServiceModel. Here CXF loads policies attached to WSDL or provided via Spring configuration. If any policy on step 2 or step 3 is found, EffectivePolicy will be created. Appropriate WS-policies will be merged for the current message and built into Neethi Policy object. All interceptors registered for result policy assertions will be added to message interceptor chain. Additionally, CXF verifies satisfied policy assertions in PolicyVerfificationInInterceptor, PolicyVerificationInFaultInterceptor, PolicyVerificationOutInterceptor. If assertion is not processed and not satisfied in corresponded interceptor, than In- interceptors throw Fault and Out- interceptors provide appropriate log messages. The practical using of WS-Policy is illustrated in ws_policy and ws_security CXF samples.